Haircare is a massive part of my beauty regime, as many of you will know and one brand that I absolutely adore and my hair adores is Ogario London, because the quality of their products is just amazing. I recently reviewed two products that I had been trialling (and have since finished up) of which you can read here, so I thought it was about time I updated and reviewed the other products that i’ve recently been using and loving! (Let’s take a second to discuss that i’ve shot these products portrait instead of the usual landscape. I’m not sure how I feel about this, so please let me know your thoughts.) 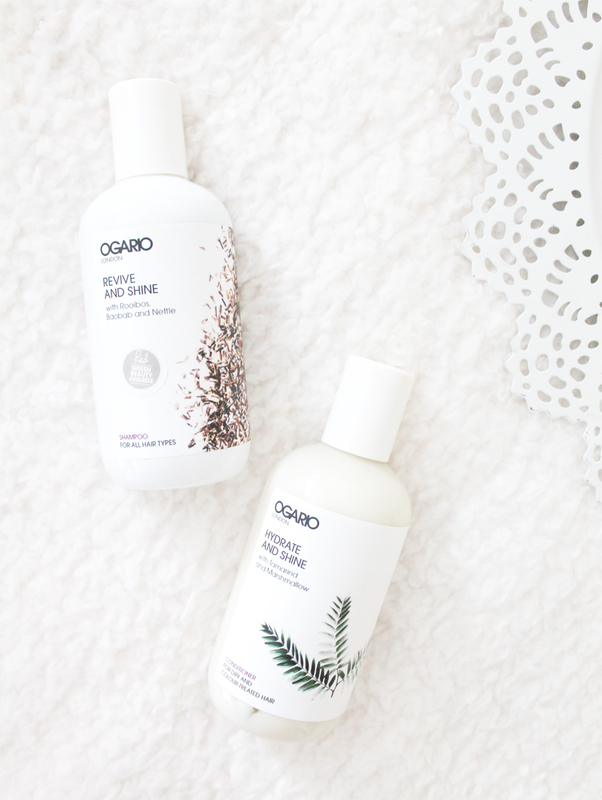 After absolutely loving the previous products from Ogario I was so excited to crack open these products that have been sat in my stash for quite some time as my hair has been in need of some pampering. What I love about Ogario London is that their haircare is made of ingredients derived from natural sources, but with that in mind with Ogario coming from a professional background in order to get the best results they do use a small amount of synthetic ingredients such as preservatives to ensure the haircare doesn’t spoil. With the use of many natural ingredients everyone of their products smells incredibly fresh and herbal, in comparison to highly synthetic hair products on the market. Kicking things off with probably the most amazing smelling shampoo i’ve ever had the pleasure of smelling, this is the award winning Ogario Revive & Shine Shampoo* (£16.50) with extracts of boabab and nettle which leave your hair looking super shiny and feeling super soft. This shampoo is lovely for when your hair is looking a bit in need as it works wonders for reviving your hair by gently cleansing and just giving your hair that little bit of life that it can sometimes lack. I love using this shampoo when i’ve let my hair get to the fourth or fifth day, where dry shampoo cannot save me anymore as it works wonders at removing any product build up, as just gives my hair a good clean and it leaves my hair smelling amazing! The next product i’ve been trying is the Ogario Hydrate & Shine Conditioner* (£18.50), of which I have previously tried out the shampoo and loved it, so I knew i’d also get on well with the conditioner. Similarly to the shampoo, this conditioner is designed to hydrate your hair especially if it’s dry or coloured but it also leaves your hair looking incredibly shiny but the ingredients are slightly different with extracts of marshmallow and tamarind, that again smell incredible. In comparison to their hair mask, this conditioner actually works very similarly and leaves my hair almost as soft as a hair mask would which to me is quite impressive, as it means that if I don’t have time for a hair mask I know that I can get similar results from this. All in all I am once again very impressed with these products from Ogario London and if you’re wanting a new haircare brand of a professional quality to try out, then I would highly recommend trying them out as their products are great and very reasonably priced for the quality of them. Have you tried anything from Ogario London?